Hard Cover books serve a multitude of purposes, high quality Muda boards are used as the backing board which give it a strong and majestic appeal. 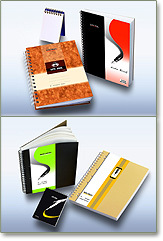 Note books are popularly bound in Wire-o. Polypropylene covers are usually used with an optional protective shield layer that can be wiped clean easily. Everyday writing is easy and fun with the convenience Spiral Bound book. Laminated Artcard covers are used for graphical prints presentations. 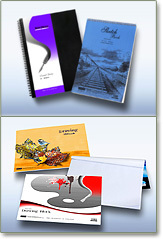 Drawing Papers comes in various grammages; 100gsm, 135gsm or 165gsm. In addition, it is acid-free and can be customized to required sizes. Sketch books are bound in spiral or wire-o. Comes in a variety of sizes comprising the A and F series, hence A4, A5, F4 sizes are offered. Appealing graphic prints covers are the selling point. These books cater to conventional usage for scholastic range and come in A4, A5, F4 and F5 sizes. It comprises two ranges which is the Kraft Cover and Card Cover. Also referred to as copy books. 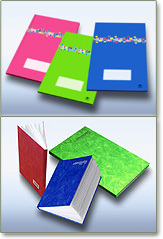 Ideal for organizing documents and comes in a multitude of vibrant colours. Ideal for school and office project. Suitable for presentation, project, photocoping, laser printing, inkjet printing. 50 – 60 gsm papers are used and sized appropriate to office desk space. The holders are also made from the recycle paper, making it a truly appealing piece.